The Script will be continuously updated. You will find the latest versions and the changelog at the page linked below. Ill try to learn more when i come home from work..
BTW, does it work so straightforward as it looks? Corona is like some king of addictive game... "Just one... More... Render... Before... Then i will do something... Useful"
What do you mean? Normally you should just have to press the button and that's it ;) Conversion results may of course differ from your original materials since corona mats don't work exactly like fR_Advanced or other shaders. So you may have to correct some things by hand. But all in all it works pretty well without to much additional fixing. It's also depending on the maps and plugins you use. 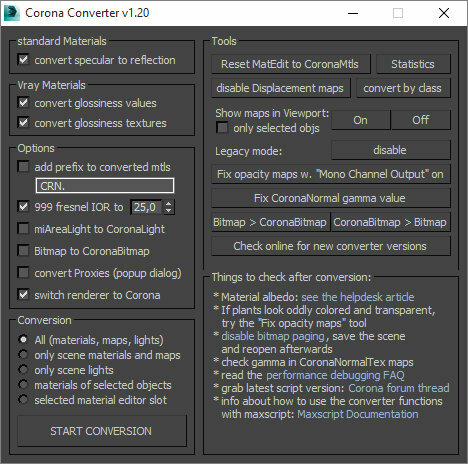 The script tries to convert vray specific maps (since corona does not support them) but there is currently no conversion for fR maps or fR materials apart from fR_Advanced and fR_Architectural (since there are so many of them in fR). Since Corona is crashing when you use a normal map somewhere in your materials I added a normal map warning with the ability to chose to replace those with a "empty" black color. it's very nice script!i just ready to standy this rendertools ....so hope too continuous updates. I found some weird behaviour with glass conversion from vray material: everything in corona material is set correctly, diffuse/reflection/refraction except obviously the twosided check , but the material preview slot appear black, if the refraction value is 0. Resetting the material in a new corona material solve the problem. Everything else works fine. I found some weird behaviour with glass conversion from vray material: everything in corona material is set correctly, diffuse/reflection/refraction except obviously the twosided check , but the material preview slot appear black, if the refraction value is 0.
mhhh.. I'm not sure what you mean? I tested converting a refractive material and I don't have any problems here. Could you be a bit more specific which material you're trying to convert? A Screenshot of an example material would be very helpful.